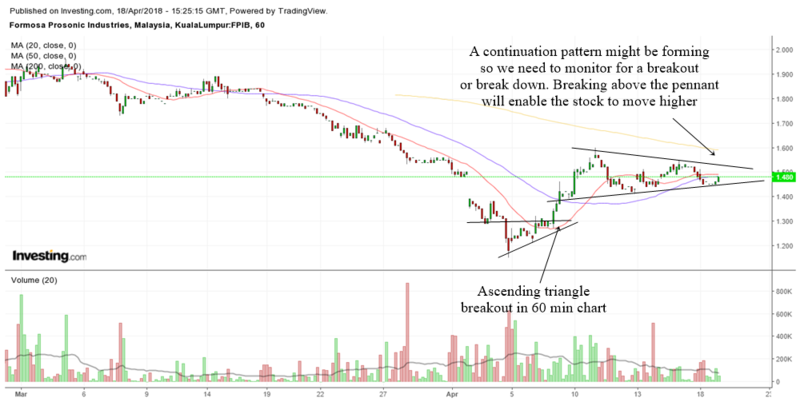 In this article we will be using technical analysis to try and figure out the price direction of Formosa Prosonic's stock price. 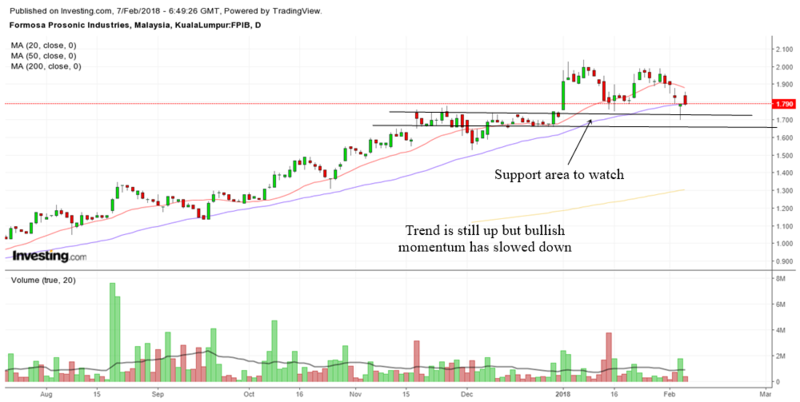 A break below a symmetrical triangle back in March 2018 helped to send the stock lower. After a drastic fall, the stock has manage to recoup some of its losses but has yet to go back to its former highs. Right now we can consider the stock to be basing. A base it where the stock is trying to determine whether it wants to start a new uptrend or continue to move lower. A look at the daily chart of FPI tells us that the area around 1.30 is now established as a support area. This is a support area to watch and we do not want to see the stock drop below this area as it will hint of lower prices. One good thing is the stock has broken above a downtend line but it has yet to show signs of strength. So far it has shown that is can make higher lows and what we want to see is for it to continue to make higher lows and higher highs. Resistance for this stock will be around 1.75 area where the stock broke below the symmetrical triangle. That is an area to watch as well. A look at the weekly chart shows us that the reason why the stock is basing around that area is because of past weekly congestion area that acts as support. Which is why it is important that the stock does not drop below the 1.30 area. Otherwise we might see more selling as long term support will be broken. This is a stock that is trying to base and hopefully the support can hold and help it to start a new stage 2 uptrend. After breaking the daily support at 1.80, the stock drop along with many many Malaysian stocks. Support once broken now will become a future resistance for the stock if it rises. The stock had an oversold bounce and currently I think it is forming a pennant. 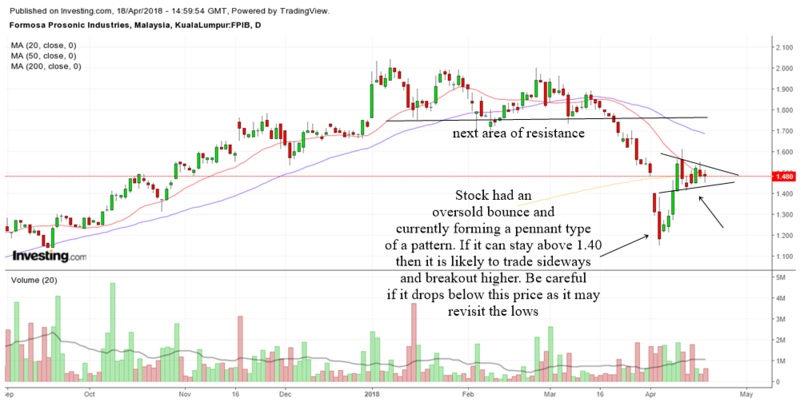 If the stock is able to stay above 1.40 then we can consider the sideways trading as a period of rest before moving higher. You should be careful if the stock drops below 1.40 as this may result in the stock revisiting the previous lows. When we zoom into the 60 min chart, its quite obvious how the stock bottomed out. Along with many Malaysian stocks, Formosa Prosonic formed a 60 min ascending triangle to bottom out. Once the stock broke out of the pattern it shot higher. Currently when you look at the 60 min chart, we can see how a pennant is building up. We can draw two lines to connect the highs and lows of the pennant. If the stock can break out above the pennant then it may continue to rise higher till it reaches the resistance area of 1.80. Be careful if the stock breaks below the pennant. While many stocks have been selling down heavily in Malaysia, Formosa Prosonic seems to be one of the stronger ones. So far the trend for this stock is still intact. I do not see any weakness yet in terms of trend. Right now I would just say that it is trading sideways resting. A stock that is able to trade sideways when the whole market declines can often tell us that it has strength. As you can see from the chart above, the daily uptrend in FPI is still very strong. It is still staying above its 50 MA. Yesterday it formed a bottoming tail kind of pattern. Although the trend is up, I must say that bullish momentum has slowed down a bit. You should watch the support area very carefully if you wish to add to this stock. If the stock is healthy, it will not want to drop below that support area. The chart above is the weekly chart of FPI. As you can see, the stock has run up quite a lot. Astute investors usually buy near the bottom and add on the way up. If this is your first time buying it, it can be dicey. But for those who have been holding on to this stock for a long time, any dips is a possible buying opportunity. Their risk is less because they have already made a lot on the way up. What I want to bring to your attention is the uptrend line. The recent plunge in the Dow happened because it broke an uptrend line in the charts. As do so many stocks that break an uptrend line tend to fall. So fat the uptrend line is still intact for FPI. But you want to be careful if the stock drops below support, the uptrendline and the rising weekly 20 MA. FPI stock is in a very nice daily uptrend. Will the bull trend continue and send this stock higher? The chart above is the daily chart of FPI stock. 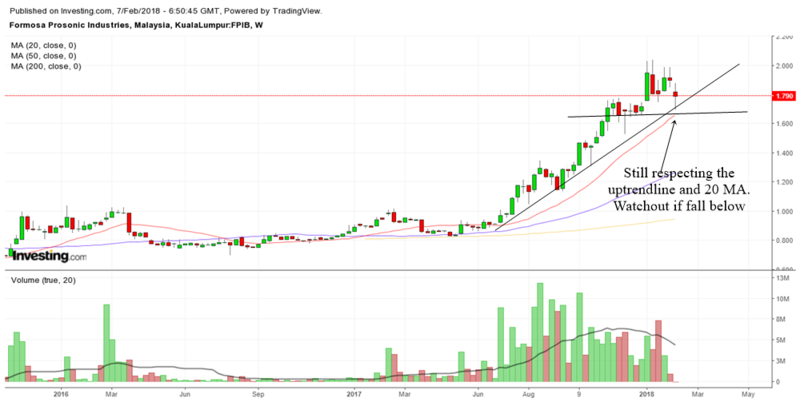 Formosa Prosonic has been in a very very nice uptrend for a very long time. Usually this is a sign of a very good stock. Slow trending up stocks usually tell us that it is a good company with improving fundamentals. Since the stock is in a nice uptrend, I would continue to be bullish on it based on the principle of "A trend in motion tends to stay in motion". Because the rise in the stock is gradual rather than parabolic, it does present swing traders with lots of trading opportunities. Mainly the buy the dips type of swing trading. These type of buy the dips usually occur at the 50 MA or when the stock gets oversold or at support areas. At this moment, FPI is dropping to a support area as well as dropping near to its rising 50 MA. The stochastics is also getting oversold. Usually this is where I would like to find entry points in the smaller time frames to try and enter the stock for a swing trade. So, patiently wait for some kind of bottoming process in the lower time frames and see if any setup appears for a swing trade. For investors who are holding this stock, you can rest assured that it is a solid stock from a TA point of view. I would remain bullish on this stock as long as it can stay above its rising 50 MA. The current support area is the box are I have shown. So, if the stock can stay above the box area, then the uptrend is very likely to continue.